However fed up they may claim to be, a certain portion of the Left in the United States remains sympathetic if not outright loyal to the Democratic Party. Many of these people are coming to support the candidacy of Bernie Sanders, and for them, the legacy of the postwar American economy looms large. When not focusing on identity politics and fear of republicans, Keynesian economic policy tends to be the ideological basis of the left wing of the Democratic Party. However, that same institution is incapable of bringing forth such reforms, not only due to the capitalist nature of the organization, but also because the leadership understands, at least unconsciously, that such reforms are impossible in the current historical moment. In the dark comedy classic Weekend at Bernie’s, two reformist insurance employees discover the corpse of their boss at his weekend beach house. In order to protect their lives and keep the party going, they spend the rest of the film working to maintain the illusion that the lifeless corpse of their boss is still alive and is having the time of his life. To their surprise, and the delight of most of the unknowing spectators, the ruse is successful, and the dead guy brings more joy to everyone who encounters him as a corpse than he probably would have were he still alive. Bernie Sanders has frequently identified himself in interviews speeches etc. as a “socialist.” When pressed as to what this means, he usually mentions something about Sweden and/or sticks the “democratic” moniker in front of it, presumably to be less scary. Yet Sanders is deliberately appealing to something bigger and more powerful than what is normally found within the bounds of typical political rhetoric. While most of the Democratic Party stoically marches right, Sanders has veered left, raising the specter of old school populism and attempting to appeal to growing outrage over economic inequality. His seemingly unpolished style, appearing and talking like your old socialist uncle who probably still mimeographs his own newsletters, Sanders appeals to the legacy of American unionism and a nostalgia for its former strength. During this period of escalating election time hype it is important to remember that this remains within a framework of mainstream left-of-center politics. By using his position within Democratic Party primary politics, Sanders has drawn more attention to this type of rhetoric than one might have thought feasible. Since Sanders has nowhere to go but up, this has been the key to his appeal. Raise the specter of working class strength, state directed social development, and populist economic outrage, but contain it within a palatable framework and channel it into the old political currents. This is nothing new. If anything this is the new normal. This same self-congratulatory politics could be seen during the 2008 Obama campaign. In his tone and diction Obama sought to subtly evoke the legacy of Martin Luther King, and would later famously install a bust of the man in the Oval Office. Today the Eugene Debs poster in Sander’s office is a similar object of note for reporters. Obama also acted as insurgent candidate against Clinton, filling a necessary power vacuum in the Democratic Party’s shallow bench of celebrity politicians. Obama promised a new kind of politics, albeit of a vaguer sort than Sanders, and sailed in on a wave of popular outrage toward the Bush administration and panic at the sudden emergence of the economic crisis. During Obama’s rise, all of the usual useful idiots pressed the line, excited that someone is able to appeal to loftier notions in anything resembling a mainstream context. To his credit, Sanders policies and political history go slightly deeper than Obama’s, but at the same time this poses a greater hurdle for him. A good deal of the Democratic Party base identifies as moderate or conservative. If Sanders hopes to actually secure a nomination, like Obama or anyone else, he will be forced to make concessions to those components of the party. All of this is moot anyway. Whether or not Sanders gets the nomination, or even if he somehow gets elected, the Democratic Party as a whole and as an institution is both unwilling to and incapable of implementing the kind of economic policy Sanders is touting. For now, Sanders has skillfully exceeded the extremely low expectations surrounding his candidacy and made great strides in closing the gap in the polls against Hillary Clinton. There has been a great deal of euphoria on some sectors of the American Left (to the extent that a Left can be said to exist in America). There has also been a growing chorus of dissident voices pointing out that Sanders platform is much less radical than some are touting it as. I suppose that I stand in the latter camp, but rather than listing the numerous political sins he’s probably committed over the years through his special relationship with the democrats, instead I’m going to examine and critique some of the assumptions underlying his appeal and then briefly look at just how meaningless Sanders conception of socialism really is. The extent to which one can place hope in reformist efforts today, depends in part as to one’s conception of neo-liberalism. It can be tough to characterize the economic opinions of the Left, since so little of it can be said to hold any kind of economic conception of capitalism. For many people, in today’s environment Clintonite stooge Robert Reich has come to constitute some kind of substantial economic guru for many people. Still, a unifying theme, from soft Marxists like David Harvey and Richard Woolf to liberal reformists like Robert Reich is that the period encompassing neo-liberalism roughly amounts to an attack on the working and middle classes by the rich. That the gutting of US manufacturing, international trade deals, the welfare state, and dying off of trade unions was the result of a concerted effort, lead on a political front by greedy elites who were not satisfied with the previous equilibrium that had been established in the economy. This skillfully and self-servingly reduces structural economic problems to a question of political leadership, and from this standpoint, it makes sense to expect that the United States could return to “peace and prosperity” through the policy decisions of elected officials. Unfortunately this picture does not conform to the reality of the last forty years or capitalism in general. Capitalists and state planners have adopted neo-liberal economic strategies for a reason. Liberals and soft soc-dems like to paint different accumulation strategies as “irrational” as a basis for justifying opposition and advocating for reform. What all of this ignores is how, under capitalism, the fate of the working class is tied to the needs and trajectory of capitalist accumulation. Following the great depression, and a series of escalating strike waves in manufacturing, a post-war boom in economic prosperity affected many sectors of the American working class. Relatively generous welfare and more progressive tax rates were feasible and prosperous policies in the wake of a robust profit rate. Fueled by the massive capital devaluation of the depression at home, and the literal devaluation of resources as an outcome of the war, the United States emerged as the strongest manufacturing center for a growing and rebuilding world market. Decades of militant labor agitation had strengthened the position of the American working class, allowing it to bargain for a greater portion of the surplus. Constituting a sort of golden period for the “middle class,” the mid-1940s-(1960s) far from being the norm, instead constituted a sort of detente between certain sections of the working class and capital. This came to a halt in the wake of the financial crisis of the 1970’s. Following the war, Western European and Japanese manufacturers were able to enter the world market with newer machinery operating at higher rates of productivity. Combined with a precarious workforce and targeted market development, these economies were able to undercut American producers, many of whom were still holding fixed capital assets that had yet to yield their full returns. Typically, as in the Great Depression, such crises are followed by a period of capital devaluation. Instead, capitalists opted for a different set of strategies to avert crisis and maintain the course of capital accumulation. Amongst these strategies were privatization, financialization, debt expansion, and a host of strategies to manage increasing surplus populations (incarceration, education, underemployment). What is important to understand is that this turn was driven by the trajectory of the capitalist economy, and not simply reducible to “corporate greed.” The rising organic composition runs as an undercurrent to all of this and has never been satisfactorily addressed. Instead what we have are increasingly sophisticated forms of state economic management. This does not meant that politics are in command, just the opposite, that the state is necessarily commanded by the needs of the economy. The politician must understand just as well as the capitalist that all functioning of the state is predicated on the maintenance of a robust profit rate. Policies which have a negative effect on the increasingly precarious capitalist growth are a nonstarter, and even those proposing them will typically recoil when forced to consider the real consequences of their decisions (see Syriza). Attempting to bring back Keynesian style redistributive policies under completely different historical economic and political circumstances would be foolish and unrealistic without a militant fighting working class which was fully prepared to tank the capitalist economy in order to build a new one. In periods of a decreasing underlying profit rate, such reforms would heighten class antagonisms and social contradictions rather than reconcile them. And that is far from the story Sanders and company are selling. When leftists go around promising that easy reform and robust economic development can go hand in hand, all they are doing is setting the stage for reaction. Fortunately, we know they are not serious. For Democrats, these ideas can only prove useful to the extent that they will never be realized. But the show must go on, and so they’ll raise the corpse of liberalism every so often, bask in the glow of the party, and return to business as usual the next day. Cause if you step back, from a distance and at a glance these appear to be serious measures. Look at all these people in the crowds, they’re so excited. This many people can’t be getting worked up for nothing, right? Sanders has spoken of running his campaign “more like a movement” but the fact that he is choosing to lead his “political revolution” within the Democratic Party, and has promised to support whoever the candidate would be (read: Hillary Clinton) should tell anyone who is serious about some kind of substantial political change everything they need to know. But for the sake of clarity, let’s briefly review why it is the Democratic Party is unfit to bring about the kind of change the proletariat needs and many sections of its own base would like to see. The relationship between the Democratic Party and the American Working class has been opportunistic from the very beginning. Representing the slaveholding interests in the South, the Party used class discontent in the north between workers and bosses as a part of its overall strategy to retain its political foothold in the federal government. Even after the Civil War, this basic class arrangement remained in place, embodied as late as the 1960’s in the white southern populism of George Wallace. Going forward, after the destruction of slavery, the Democrats acted as a force of loyal opposition to the industrial expansionism of the Republican Party. For many however, this is irrelevant. Instead they point to the New Deal of FDR, and Great Society Legislation of Lyndon Johnson in order to shore up political credibility for the Democratic Party. This relies on a form of historical amnesia in which the broader context of each administration is completely forgotten, and this kind of lineage of peace and prosperity is projected across administrations from FDR to Carter to Clinton and sometimes even Obama. In the same breath, the historical lineage tracing back to the Democratic defense of slavery and its current complicity in imperialism is completely disavowed. If we understand the Democratic Party not as the vanguard of American Leftism, or even a bulwark against rightists, but instead as a recuperation mechanism for a particular faction of the ruling class, the political continuities and discontinuities between administrations and eras comes into much clearer focus. The first Democratic Party president that leftists will point to is Franklin Delano Roosevelt. Kennedy left little of substance behind during his short tenure as president, and Johnson’s legacy, in spite of his welfare and civil rights legislation, is remains largely tainted for many by the Vietnam War. By contrast FDR stands as architect of “the good war,” savior of the economy, and redistributor of wealth. However FDR’s New Deal can only be understood within the context of American Capitalism of that era. At the beginning of the twentieth century, the American Working class was gaining serious ground in developing its own political organs and institutions. This era saw the rise of trade Unionism in the AFL and CIO, the fighting syndicalism of the IWW, the developing socialist parties as well as the Communist Party USA. However imperfect these organizations were, their existence indicated a possibility of an American working class capable of asserting itself as an independent political force. Perhaps more importantly wildcat strikes had been taking off in the United States and would continue to escalate through his administration and well through the war. Workers were thus taking on modes of direct action independent of the developing bureaucracies of the representatives of labor. All this boded poorly for the American ruling class, who had enjoyed a relative degree of political hegemony in comparison to much of what had taken place in Western Europe. FDR rode into office on top of a massive economic crisis, and governed in the shadow of dictatorships throughout Europe and growing inter-imperialist conflict globally. FDR’s reforms fell well short of the demands implicit in the actions of the American working class at the time. His penultimate solution, a war economy, served to redirect the trajectory of production and after the war served to place the U.S. as the foremost global superpower. This mode of war production, later termed the “military industrial complex” has been more or less in place ever since. The coexistence of state expansion and welfare spending and a broader imperialist spending and foreign policy could be seen in starker relief under the Johnson administration decades later. While the military spending has remained more or less invariant and essential to capitalist accumulation in the United States, the particular class, economic and historical conditions that produced the former reforms have been gradually eaten away at ever since, often with the direct complicity of the very Democrats who are allegedly supposed to prevent this. Yet still we are promised a return to this, and Sanders brand of cruise missile socialism continues it. Herein lies the focal weak point of Sanders form of left-liberalism. In spite of the frequently hysterical anti-war activism of the left (“no blood for oil man”) here sits no room in this outlook for any meaningful internationalism. When military spending is even seen as a problem, it is understood either as simply an irrational expenditure, or it is opposed on moral terms, as if the U.S. economy received no material benefits from its imperial hegemony and all spending could simply be shifted to infrastructural development with no economic downside. For many, the strongest case to be made for Sanders insurgent candidacy to be made stems from the fear of repeating the example of Ralph Nader, who acted as a “spoiler” in the 2000 presidential election. In spite of the largely inconclusive evidence regarding Nader’s role, this event has loomed large in the liberal mindset, turning Nader from being the reformist hero of the 1970’s into a pariah responsible from everything from the War in Iraq to 9/11 depending on who you talk to. What followed in the subsequent anti-War movement was a redoubling of efforts in support of the Democratic candidacy, leading to the pathetic spectacle of John Kerry’s run. But what is strange, even on its own terms, about the “lesser of two evils” argument his how the people making it paint this grim picture of our current situation but seldom paint any kind of portrait of how to get out of it except through acquiescence to it. This might have made a modicum of sense to the politically naive during the height of the anti-bush anti-war demonstrations in 2003, but after nearly 8 years of a democratic administration, and following the failure of a Democratic majority to pass meaningful health care reform that wasn’t just a glorified coupon system, the Democrats today are in sore need of credibility. After decades of moving to the right and an eight year presidential term that has produced little reform to speak of, it is becoming I think increasingly difficult for Democrats to sidestep the glaring contradictions between what is expected of them and what they actually do, facilitated in part through the increasingly open information exchange of the internet. Sanders may represent a last ditch effort to recoup the left wing of the party and get people #readyforhillary. What both Sanders, and Nader missed was the basis of political power. Nader believed that it was necessary to build a political institution outside of the Democratic Party. However the Greens have no basis in a strong class capable of acting politically, and their platform remains a sterner variation on the basic liberal schema. A great deal of the novelty surrounding Sanders campaign is his refusal to completely disavow the term “socialist” whenever it is applied to him. Partly this represents a form of savvy on his part, it is said that Obama’s poll numbers went up the more the term was applied to him by his detractors, and partly it serves as a useful rhetorical maneuver. At the same time, the seemingly increasing receptivity to more leftish politics suggests something about our current moment. Sander’s vague allusions to Scandinavia and Democratic Socialism, seldom run into the concrete or even link up directly with his policy proposals. Instead it serves as more of a rhetorical function. Even as we near the 30th anniversary of the collapse of the Soviet Union, red baiting remains useful for rightists, and an effective measure for shutting down any discussion of reform or even any criticism of the current acceptable functioning of capitalism, no matter how minor. Thanks to the sustainable functioning of the Scandinavian welfare states, left-liberals have a relatively inoffensive model they can point to. In other words, Sander’s “socialism” is really just a way for him to call the bluff of rightists his actual policies themselves are liberal reformist at best. If you turned the last sentence on its head, you might have a statement from an actual socialist. It is entirely inconceivable to Sanders that the abolition of nation states could be something desirable or necessary as an eventual goal. This glaring but inadvertent cluelessness is fairly typical of old-school unionist DP politics. Sanders doubles down on state protectionism. He even goes so far as to threaten to put the genie back in the bottle on NAFTA, as if all the Mexican farms run off the land by American agri-business will somehow re-sprout again and the “illegals” will just go back home to their plows. As of yet, Sanders offers no vision on how he might control capital flight, or do anything to deal with the cheaper labor and newer equipment that inevitably emerges in a world market. A globalized market only points even more starkly for international organization and solidarity of the poor and working classes worldwide. Instead Sanders hopes to recreate some kind of accord between the working class and the ruling class. He refers to this accord as “the middle class,” and he refers to it often. This sort of nationalist strategy of cross-class amelioration in the form of expanding the old buffer is, in the light of a genuine class politics, fundamentally reactionary. Finally, this brings us to the question: what does the phenomenon of the Bernie Sanders campaign mean for Communists? It is very easy to adopt an oppositional stance, and begin rattling off a laundry list of Bernie Sander’s political sins, but I think it is even more important for Communists to cut right to the heart of the matter. Bernie Sanders is not a socialist, because Bernie Sanders does not seek to move society beyond capitalism. A socialist program must be necessarily transitional to Communism, or it will necessarily transition to failure. If Sanders represents and capitalizes upon a reviving interest in socialism, then it is our task to clarify what socialism really is and what it means. We must critique the limitations of Sanders overall strategy, and in the process underline what directions things must take in order for there to be real change. We cannot look to sell people on easy magic bullet solutions either with the intention of winning people’s interest or counting on such solutions tanking in order to prepare people for the “real alternative.” Instead we should recognize that people are beginning to recognize some of the limitations of Democratic Party politics. We should push them further. Another component of this as that a lot of mainstream American news and politics runs on fear. The truly skilled politician knows how to transcend this and appear to offer people something beyond this schema, it’s not for nothing that the central word of Obama’s campaign was “Hope.” In his promises of reform, and his seemingly different way of doing things Sanders appeals to a similar mindset. In deconstructing the politics of the Left, we must at the same time point to an alternative politics and a vision for a higher and better form of society. Still, even within this, it is hard to escape the nexus of the current political schema. What is required perhaps more than anything else is a longer and deeper view both of the past and of the future. So long as the lessons and implications of history are ignored, any capacity to imagine future change or long term development will remain necessarily stunted. We must not only oppose all bourgeois political parties, but also the conception that the outlook of our political horizons cannot extend beyond the next four years. 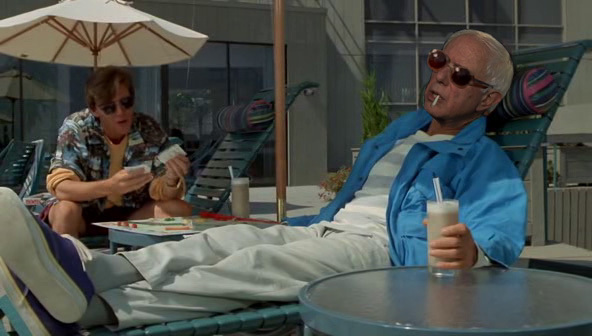 Weekend at Bernie’s ends with the two main characters getting everything they wanted. An assassin goes mad repeatedly attempting to kill Bernie, and is convinced he is still alive even when he is being taken to jail. The two young men get to keep their jobs, one gets the girl, and the corpse slips out of the ambulance to fall on the beach and be symbolically buried by an indignant youth. So far Sanders has been able to placate the latter element, but if the savvy activists and staff of his campaign have their way, they can take this thing all the way to the general election. There might be more appeal to the Sanders pitch than it seems. Republicans could come off as hysterical (as they did with Obama) crying socialist and communist long after the DP party mainstream, or anyone else, have ceased to really believe it. Whether he wins or is forced to go back to his Senate seat, at the end of all this, careers will be made. And Sanders and his specter of sewer socialism will be wheeled back to be buried in the place that all American working class politics go to die: Washington DC. This entry was posted in Uncategorized and tagged Bernie Sanders, Democatic Party, keynesianism, reformism, socialism by jurassic marx. Bookmark the permalink. Good points overall. But I was hoping for more discussion on what “socialism really is and what it means”, since most discussions of Sanders and his particular brand of socialism/social democracy don’t ever seem to dive into what real revolutionary socialism looks like. I think a lot of this has to do with disagreements among non-Sanderite socialists in the US on what revolutionary socialism is in the first place; some groups argue for an independent workers’ party, others adopt a more anarchist or movementist stance, others are linked up with liberal-progressive community groups and non-profits. I don’t think the main task of communists should be merely to critique and discuss Real Socialism vs Sanders Socialism; I think it should be to build those independent political and social organizations that can operate not just outside the Democratic Party, but outside the institutions of bourgeoisie democracy in general. We can’t simply engage and debate against social democracy/nationalism in the abstract and in the terrain of the ideal; we have to actually bring these critiques into the realm of the material, and engage in concrete projects that build workers’ power economically and socially (and thus, politically). Conveniently, having concrete projects feeds nicely into Sanders’ rhetoric about developing a general political movement, and so there is already a nice framework that exists for independent revolutionary socialist groups to reach out and engage with Sanders supporters who buy this idea of being part of a larger political movement, beyond just an election campaign for a single politician. I agree, I just didn’t go into it because, “having concrete projects” is something that should be going on in general, not specifically in response to the Bernie Sanders candidacy. On the subject of “having concrete projects”…it’s a potentially dangerous issue which revolutionists get caught up on. The Maoist RCP has plenty of such “projects”, are they bringing us any closer to communism? No, the opposite actually. The only thing that produces revolutionary consciousness is participting in *real* and massive working class struggles. Bernie Sanders couldn’t be further from that. We need a US left communist group/network/etc, which follows the actual tradition of left communism. Only then we can start discussing things like intervening in the class struggle. I thought this type of empty/unfulfilled promise would make the leftists who use it seem irrelevant or dumb but you’re saying it can lead to reaction. Can you expand or point to other instances where this has been the case?